Recently, the 721st Air Mobility Operations Group held a safety down day on Ramstein Air Base. 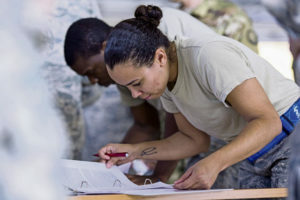 Each of the organizations under the 721st AMOG — the 721st Aircraft Maintenance Squadron, 721st Aerial Port Squadron, 313th Expeditionary Operations Support Squadron, and 10th Expeditionary Aeromedical Evacuation Flight participated, crafting events as they pertained to their job. U.S. Air Force 721st Air Mobility Operations Group Airmen review maintenance records as part of the maintenance relay during the 721st AMOG safety down day on Ramstein Air Base, Oct. 19. The purpose of the down day was to allow 721st AMOG leaders to focus on growing their Airmen. 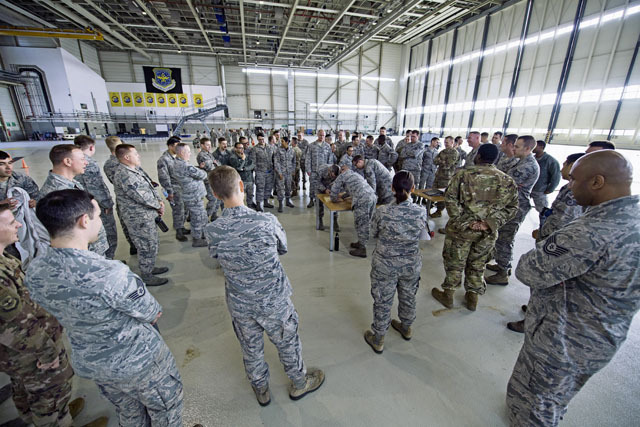 They worked with the 618th Air Operations Center to minimize air traffic into and out of Ramstein for the day to ensure sufficient training was conducted and focus was directed to the material. “Throughout the Air Force sports and [recreation] is one of the mishap producers, so we started out the day with a fitness challenge and fun run,” said Tech. Sgt. Carlton Anthony, 721st AMXS safety noncommissioned officer in charge. 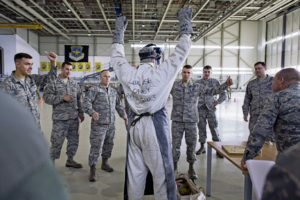 A U.S. Air Force Airman assigned to the 721st Aircraft Maintenance Squadron puts his hands up as fellow Airmen verify he is wearing all the correct liquid oxygen protective equipment as part of the maintenance relay during the 721st Air Mobility Operations Group safety down day on Ramstein Air Base, Oct. 19. The suit is used daily by members to service aircraft liquid oxygen systems. In addition to the relay, physical fitness, resilience and other wingman concepts were all included in the safety down day. “It’s been a good, well-spent day so we can take this further in our careers,” said Martinez.